You gain 43,500 points [?] Loyalty program points By purchasing products included in the loyalty program, you gain points, which then can be exchanged to other products available in the store or for a permanent discount. Only available to registered customers. We already reviewed many mobile workstations from the established manufacturers. 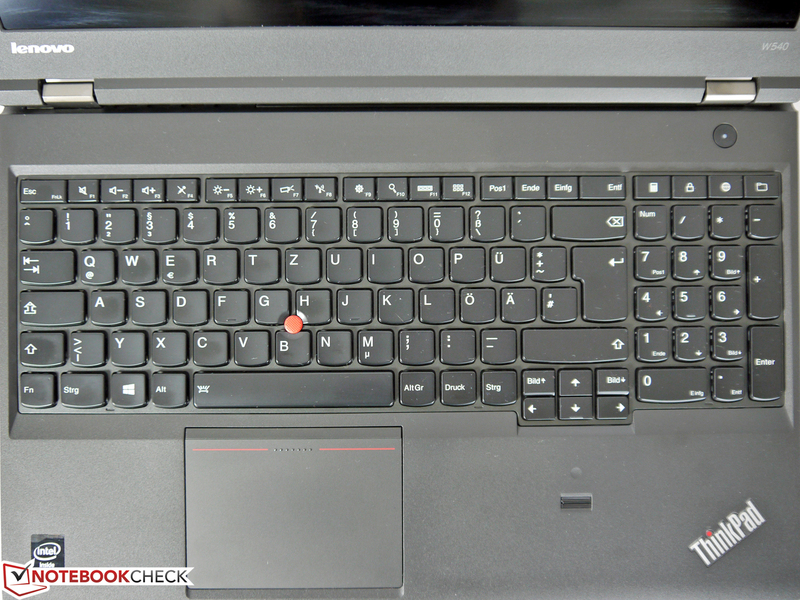 Now we have a closer look at Lenovo's ThinkPad W540, which is eagerly awaited by many users. It represents the ideal business notebook with its legendary branding and offers the performance of a powerful workstation as well. However, loyal ThinkPad users had to accept numerous changes in the recent past that did not always result in unlimited enthusiasm. Some keywords like ThinkLight, keyboard design, touchpad design, battery bridge or surface materials are often controversially discussed amongst our forum users. Our review unit is more of an entry-level configuration at around 1,600 Euros (~$2217), but it is well equipped in the core areas and well suited as a basic configuration for professional scenarios. Our configuration uses an Intel Core i7-4700MQ CPU, Nvidia's professional Quadro K1100M GPU, 4 GB RAM, 1 TB storage and a high-resolution IPS display with 2880x1620 pixels. ... and at the display frame. There are some uneven gaps and material transitions. 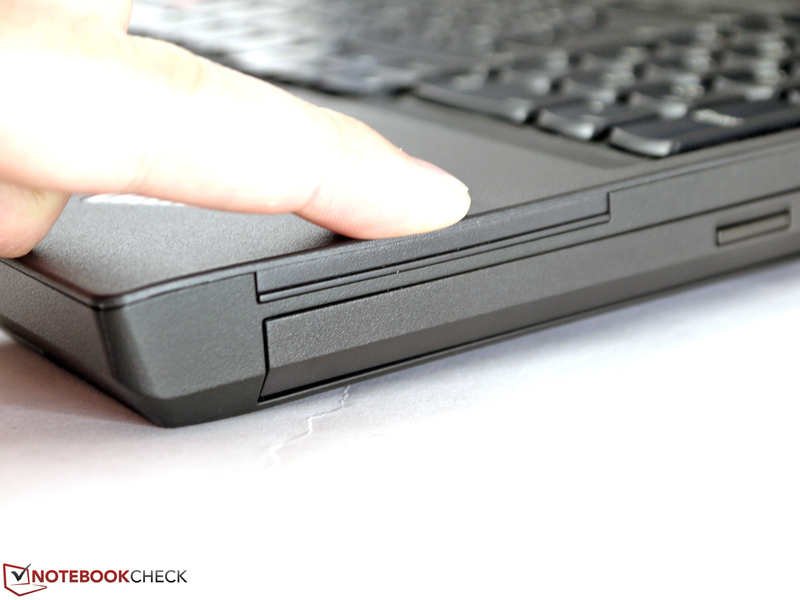 The completely redesigned case is not only used for the workstation ThinkPad W540, but also for the ThinkPad T540p. A large part of the case is made of a carbon fiber-plastic material, which is complemented by a magnesium frame inside the base unit that improves the stability. 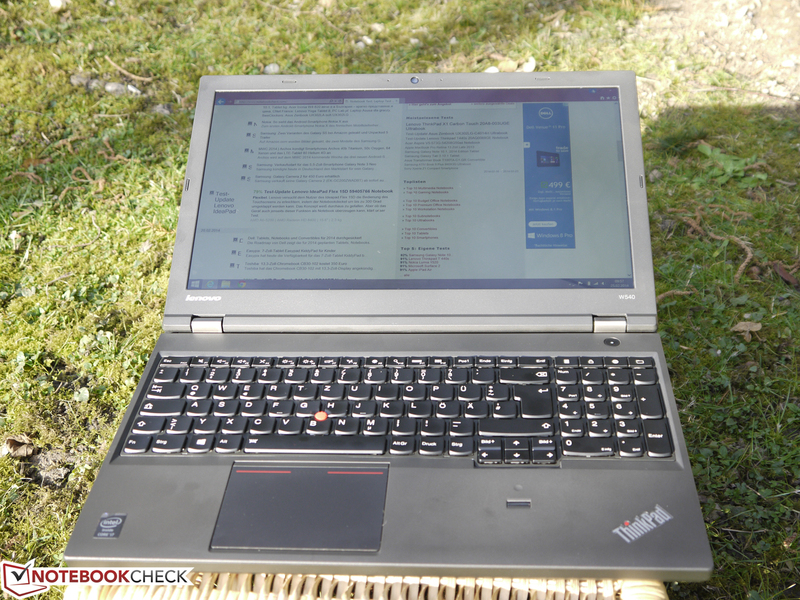 Apart from the slightly grayish color scheme, the overall appearance did not really change when you compare it with the predecessor and you still know that it is a ThinkPad. The surfaces now look cleaner in general and benefit from the lower number of parts and therefore fewer transitions between them. The surface is slightly roughened, feels very comfortable and does prevent the typically greasy look of the predecessors. 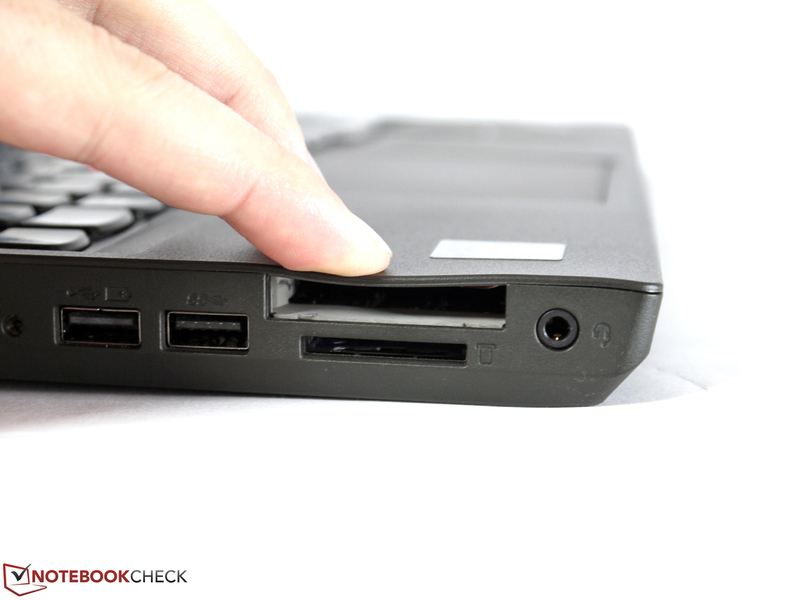 Overall stability is good, but there are the typical weak spots above the optical drive and the battery tray. You can dent the material, which does result in some quiet creaking sounds from the palm rest. This is the spot where the surface hits the inner frame. The display cover can be twisted with some force, but it does leave a sturdy impression in general and there are no picture distortions. Familiar metal hinges keep the display in position well and only allow a slight bouncing when you move it. Only HP's ZBook 15 is better in this regard since it left an excellent impression in our review. The build quality is still good, but there are some details that cannot convince us, especially when you consider the price range. The left side panel is not completely flush and protrudes slightly. You can also see that the top and bottom of the base unit do not fit properly in the area of the hinges and subsequently result in a misalignment when closed. The DVD drive is flush at the front of the case, but it is further inside the case at the back. Our review unit also has some issues with the keys on the left side of the keyboard since they are not properly integrated. 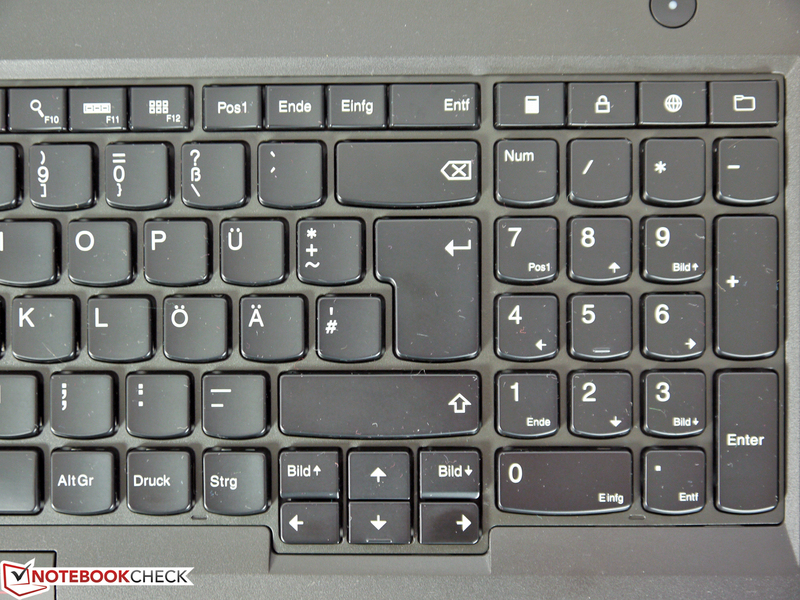 Depending on the pressure, the keys Shift, Caps-Lock, Tab and F2 are stuck. 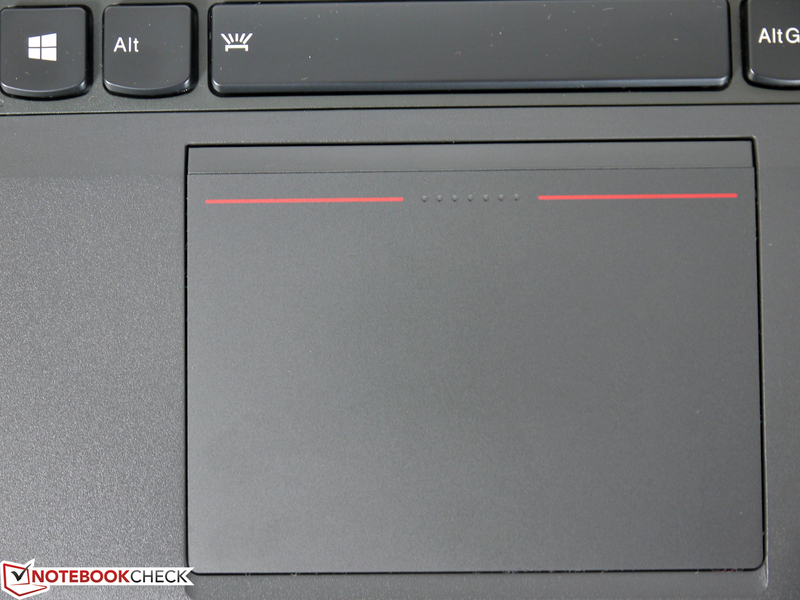 The touchpad quickly results in frustration because the lower corners do not accept clicks or inputs, respectively. We do not know if this is an isolated or a general problem at this time. One advantage of the case construction is the low weight for a mobile workstation. Our review unit weighs just 2,480 grams (~5.5 pounds), which beats the Toshiba Tecra W50 by around 200 grams (~0.44 pounds) and the HP ZBook15 with a DreamColor display even by around 900 grams (~2 pounds). This is a good precondition for use on the road and it does noticeably reduce the weight of your notebook bag.on is the low weight for a mobile workstation. Our review unit just weighs 2,480 grams, which beats the Toshiba Tecra W50 by around 200 grams and the HP ZBook 15 with a DreamColor display even by around 900 grams. This is a good precondition for the use on the road and it does noticeably reduce the weight of your notebook bag. The port equipment is on a decent level, but it is limited to the most essential ports. Users of the ThinkPad W540 can neither use FireWire, eSATA, a modem port, a serial port nor a big ExpressCard/54, but you can at least use an ExpressCard/34 slot for expansions and some older ports as well as a docking port. Otherwise, there is an analog VGA port, a modern Thunderbolt port (for data, displays and multiple devices in a chain), 2x USB 2.0, 2x USB 3.0 and a card reader. The ports on the left side of the case are somewhat crowded and will eventually block each other and affect the usability when you attach cables or devices. The two USB ports on the right side however have enough room. We also like that the power connector and the Gigabit Ethernet port are located at the back. This hides these cables pretty well during stationary operation. The transfer rates of the ports are very good and up to date. You can see the results in the attached chart. Our review unit is equipped with Intel's Wireless-N 7260 WLAN module. It supports 2.4 and 5 GHz networks, has two antennas and a theoretical maximum transfer rate of up to 144 Mbps. We measured transfer rates between 2.9 and 5.6 MB/s in our individual review environment, which is obviously just an indicator. There were no connection losses or other problems during our review. The communication features are completed by Bluetooth 4.0, Gigabit Ethernet as well as a 720p webcam. The camera is sufficient for well-lit rooms, but it creates picture noise and loses quality in darker environments. Lenovo offers other WLAN and WWAN modules. The notebook is WWAN-ready (necessary antennas already integrated); you just have to integrate a WWAN card (M.2). 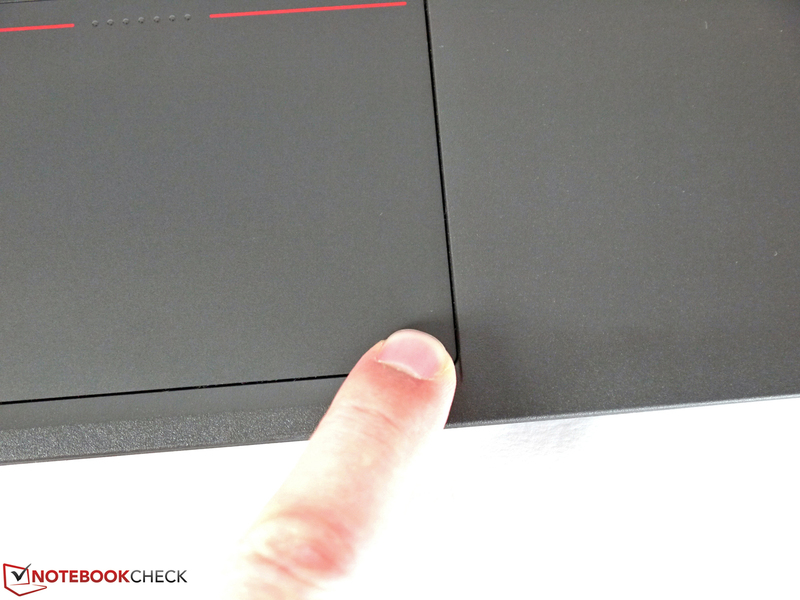 Besides the usual passwords for the BIOS and operating system, our reviewed ThinkPad W540 also has a fingerprint reader, a Trusted Platform Module and Intel's Anti-Theft. Computrace is available as an option as well. The slot for the SmartCard reader is empty in our case, but you can order it when you customize the device in the online shop. 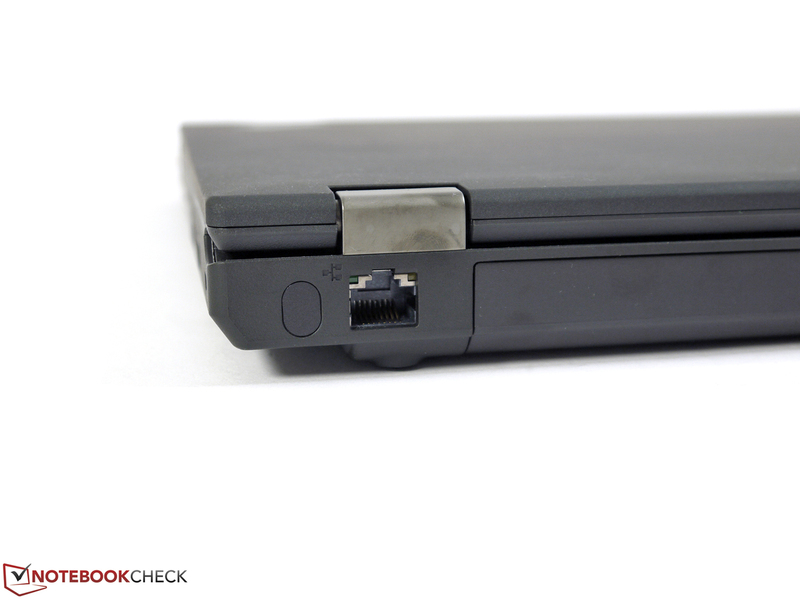 Further information is available in our FAQ article about security solutions for notebooks. We already mentioned that you cannot use many of the accessories from the predecessors. Bay adaptors, docking stations and power supply units have been redesigned. The ThinkPad Pro Dock with a 65-Watt power adaptor (40A10065EU) retails for around 150 Euros (~$208) and offers, amongst others, a DisplayPort, DVI-D and VGA. 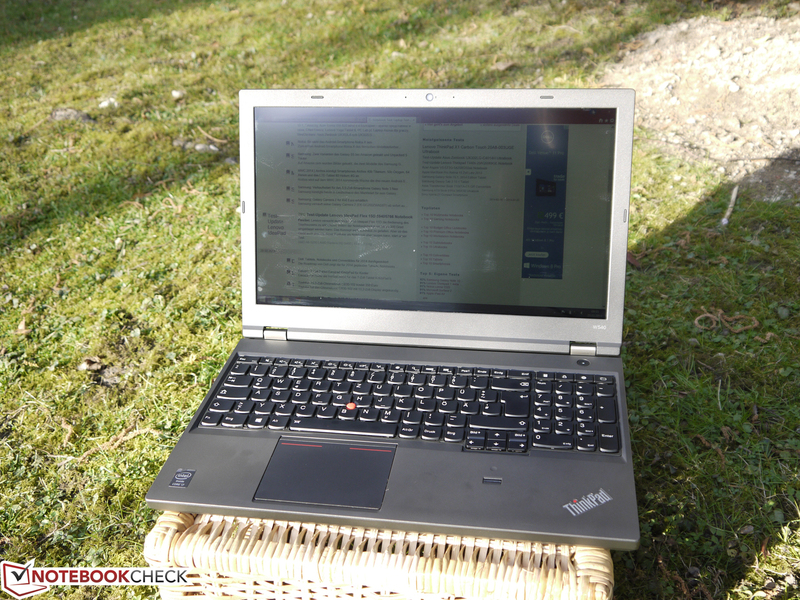 Lenovo noticeably changed the maintainability of the mobile workstation in some areas. You can now access all four memory slots (dual-core CPUs with 2 slots) via a maintenance cover on the bottom, which means you do not have to remove the keyboard anymore if you want to upgrade the RAM. Lenovo also changed the hard drive cage; the rubber frame at the sides has been waived and replaced by a thin frame. You cannot mount a drive without this frame, not in the standard hard drive bay, nor in the Ultra Bay Adaptor IV, which was also redesigned. It seems that Lenovo only wants to sell its own drives since they are already equipped with this frame. 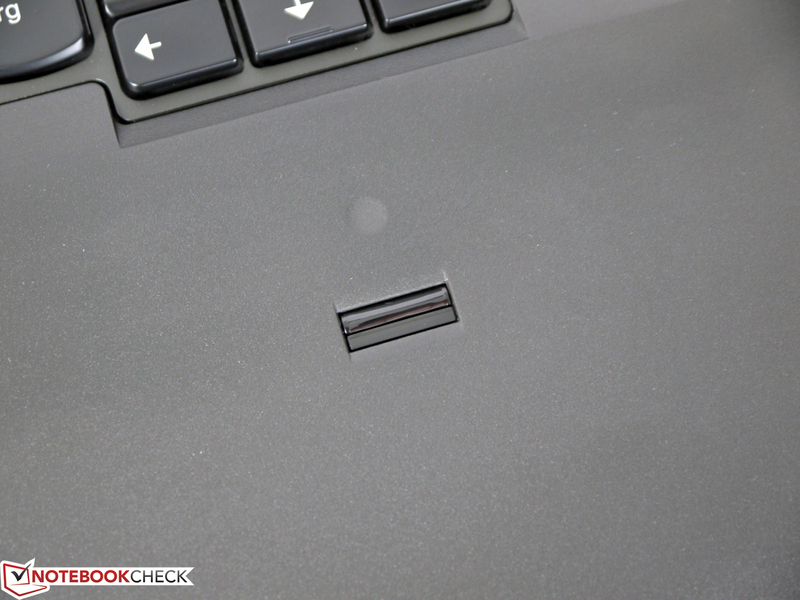 According to Lenovo's support, you cannot buy this part separately. Similar to the other current models, docking stations, bay adaptors and power supply units of the predecessors are not compatible anymore. You have to open the large maintenance cover and loosen a big screw before you can remove the optical drive. Access to the fan requires dismantling of the whole bottom cover. Our review unit has two M.2 SATAe ports. Lenovo offers SSD caches, WLAN and WWAN modules for this port. You can only integrate modules with a length of up to 42 mm, but currently available M.2 SSDs have a length of 80 mm, so you cannot use them. The BIOS can be accessed by pushing F1 during the start-up. As usual, Lenovo's Hardware Maintenance Manual is a big help if you want to replace components. 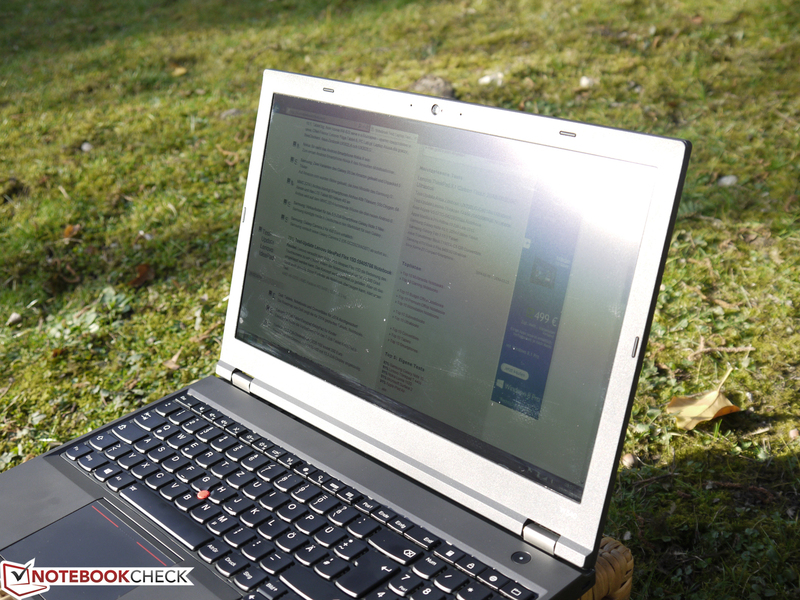 Lenovo grants a standard warranty period of 36 months for its W-series notebooks. An upgrade to four years with on-site service, for example, costs 80 Euros (~$111). 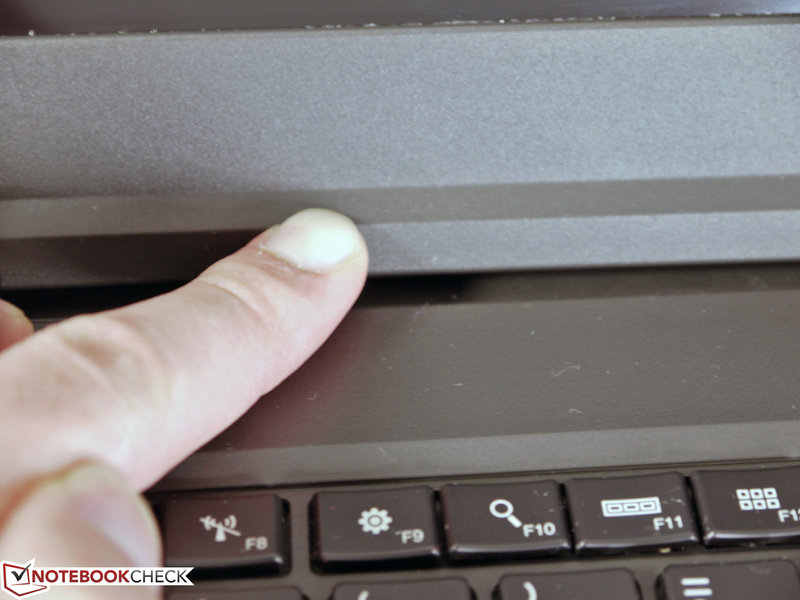 The chiclet keyboard can convince us with a good pressure point, large keys and a convenient typing noise. The arrow keys are larger compared to many rivals and easy to use. 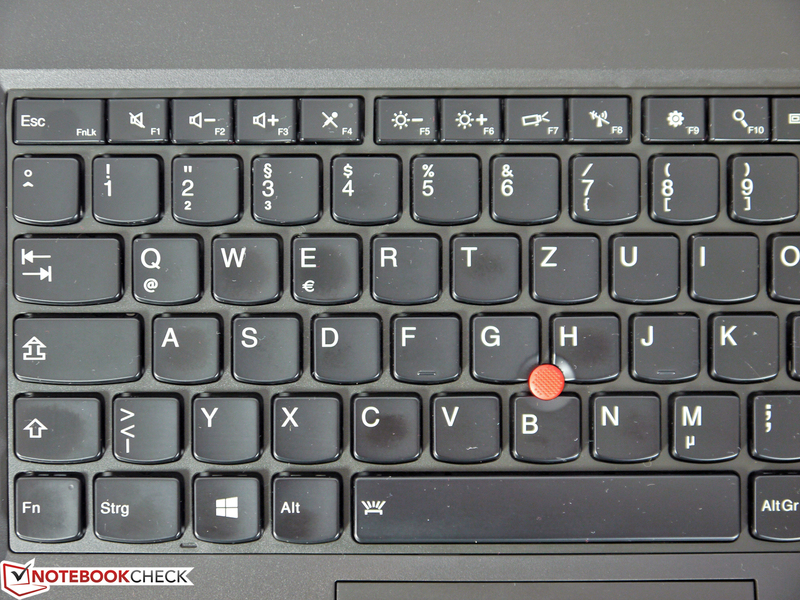 The keyboard is very firm and provides good feedback. A separate numeric keypad is a nice addition but also results in an asymmetrical position of the touchpad. You also get an F-row with additional multimedia features and controls that improve the handling. You can change the function of the FN and Ctrl key within the BIOS. Our review unit had some issues with notchy keys on the left side, which are probably caused by build quality problems. We did not notice this problem in our reviews of other current devices, so this is probably an isolated incident, but it does affect the rating of the build quality. The most controversial change in regard to the input devices is certainly the 5-button trackpad. The integrated buttons for the touchpad and the TrackPoint were unreliable and did not work at all in the bottom corners of our review unit. 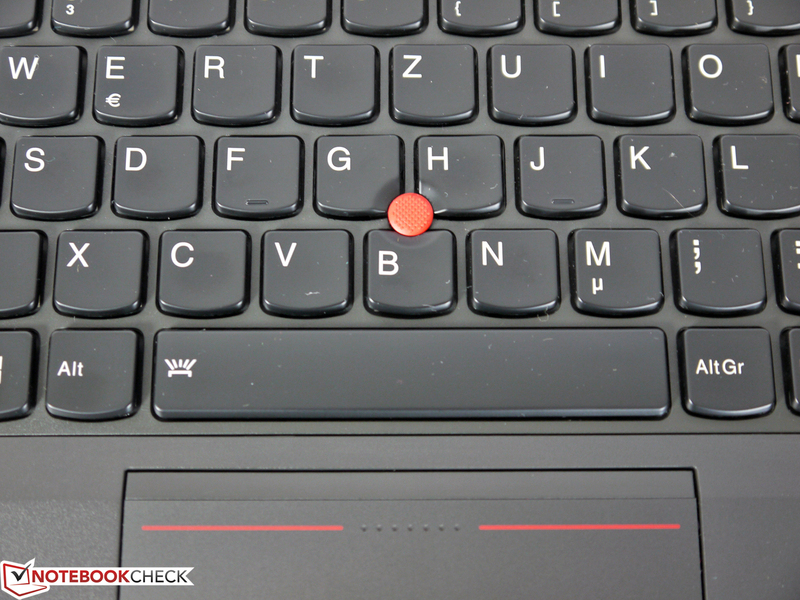 While the touchpad works well with a two-finger tap instead of a right click, it requires a lot of patience to use the TrackPoint and the related buttons at the top of the pad. Compared to the dedicated buttons of the predecessors the current solution is certainly a big step in the wrong direction. This is very unfortunate because the touchpad itself is a noticeable improvement in terms of basic features like gliding capabilities, responsiveness and accuracy. Multi-touch gestures are also convenient on the large touchpad surface of 100 x 76 mm (~4 x 3 inches, minus the button area). The TrackPoint also works flawlessly. 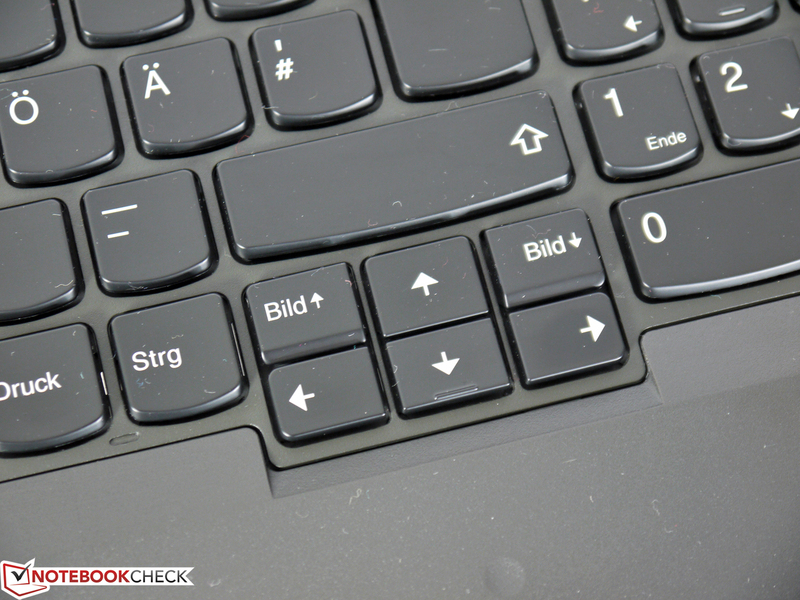 It allows a precise and fast control of the cursor and is therefore a good alternative to the touchpad. 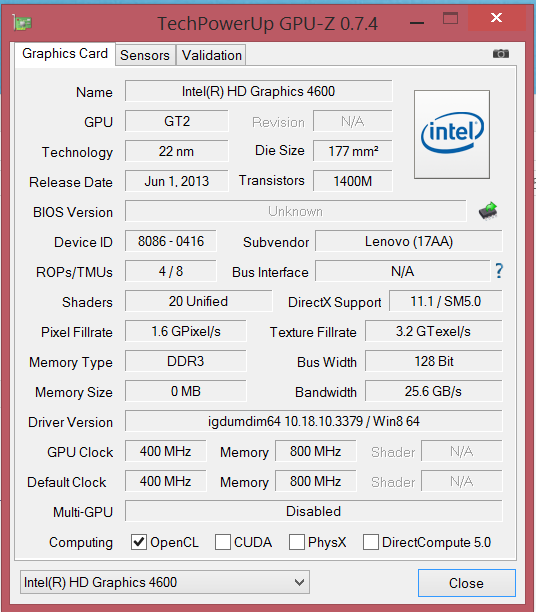 Lenovo currently offers the ThinkPad W540 with two different displays. The less expensive versions are usually equipped with a Full HD TN panel. 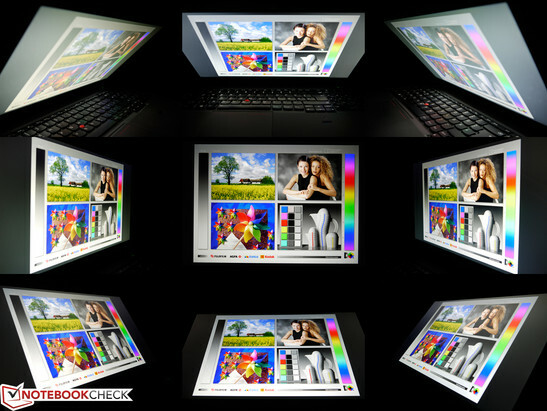 It has a resolution of 1920x1080 pixels, an anti-reflective surface and is supposed to manage a brightness of 300 nits according to the specifications. 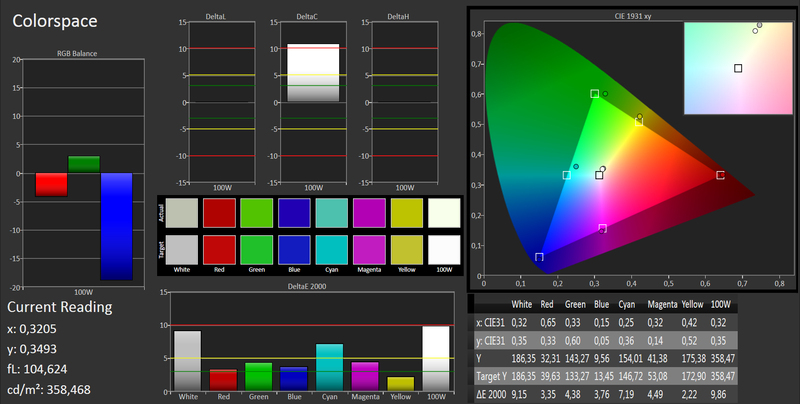 The second option is a 3K IPS display, which is also the display of our review unit. You get a much higher resolution with 2880x1620 pixels and better viewing angle stability due to the IPS technology. The anti-reflective display surface is not truly matte, but it can be compared with semi-gloss surfaces from some business convertibles. Reflections are diffuse and light sources, depending on the angle, can create stronger reflections compared to conventionally roughened surfaces, but it should still be tolerable for most users. What you get in return is a fine, sharp and appealing picture. 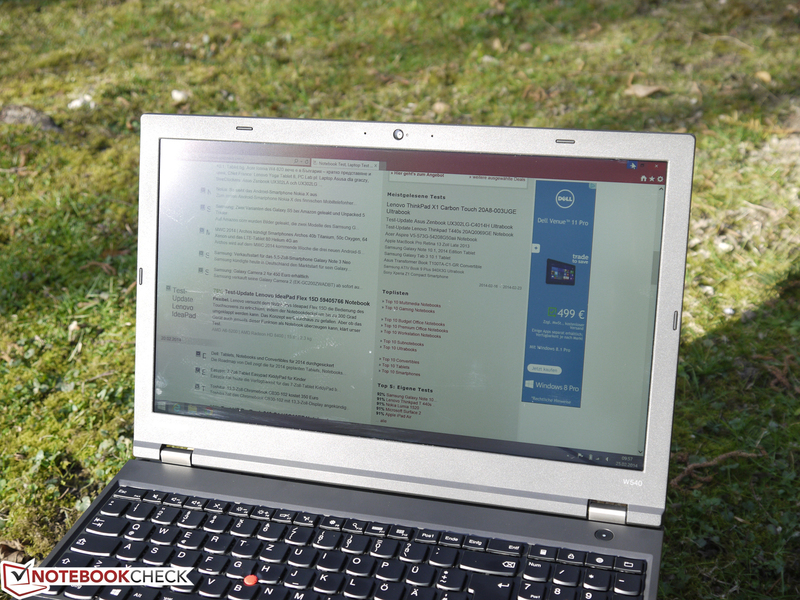 The additional charge is currently 106 Euros (~$147) in Lenovo's online shop, which is fair. 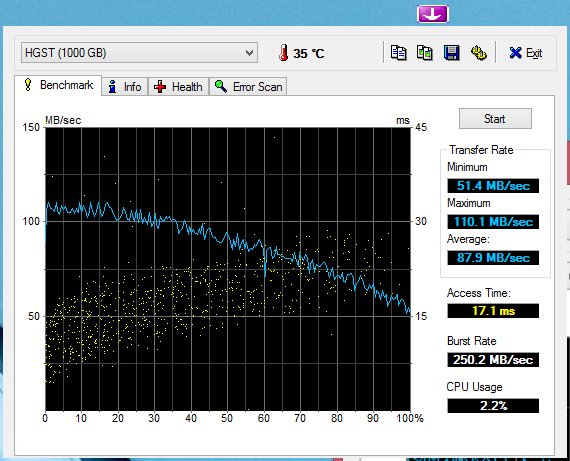 It is also nice to see that the scaling problems were noticeably reduced with Windows 8.1. Fonts are now sharp in the Chrome browser and small windows and fonts are now generally rare. Some applications, for example Photoshop Elements 12, show the correct size of menu items, but the tools are still comparatively small. 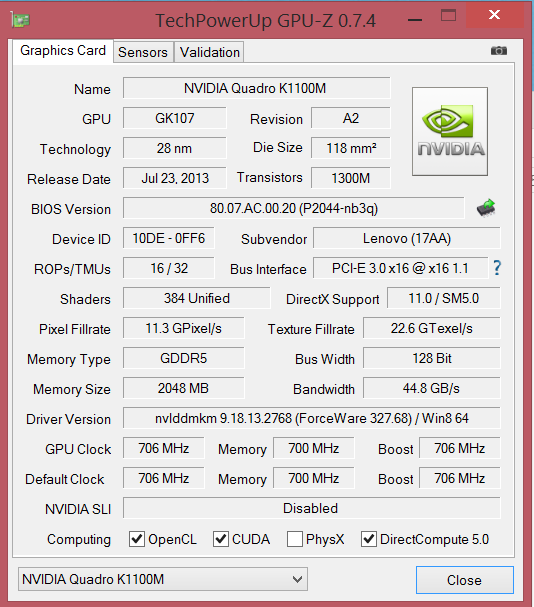 Only SPECviewperf 12 did not manage to accept the necessary minimum resolution of 1920x1080 pixels. It did not work on the internal or an external display, which is why we could not even start this benchmark. 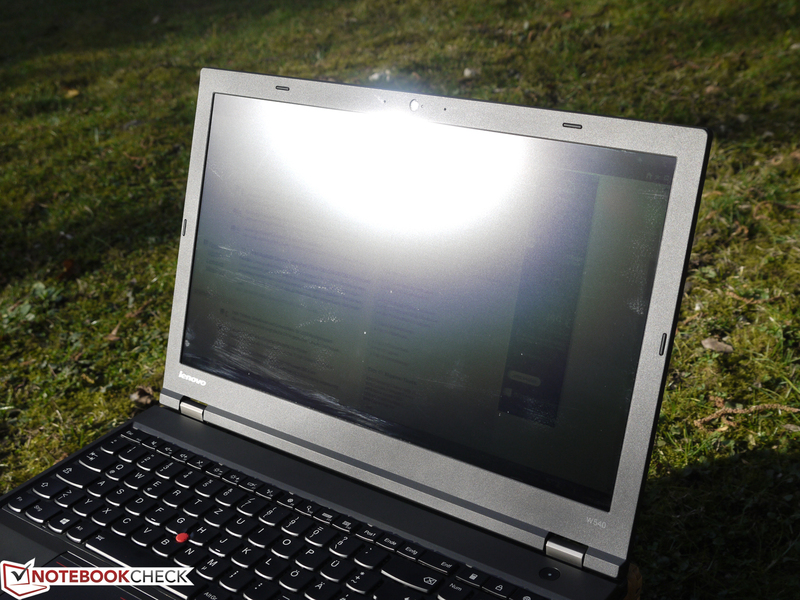 Lenovo specifies the brightness of the 3K display as 350 cd/m², and our measurements actually showed 348 cd/m² in the top left corner. However, the brightness is significantly lower at the other measurement spots with just 286 cd/m² in the bottom right corner. 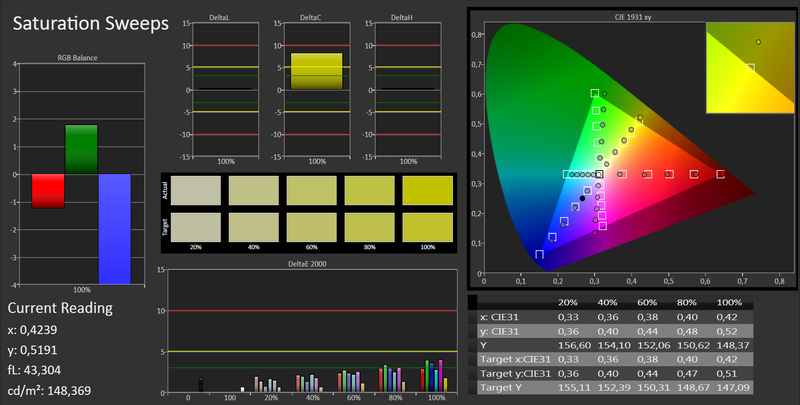 This results in an average luminance of 310 cd/m² and a brightness distribution of 82%. These differences, however, do not have a big effect in practice. We could not determine screen bleeding, clouds or other bright areas around the frame. 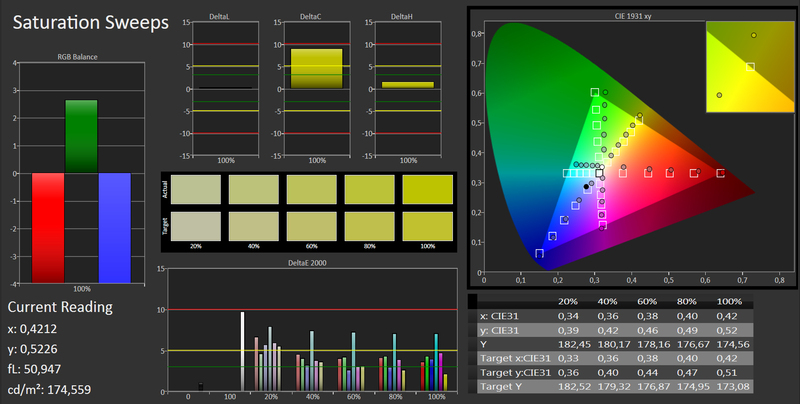 The brightness can be adjusted in 10 steps, starting from 4 cd/m² up to 332 cd/m² (each at the center). We measured 141 cd/m² in step 8, which is also the setting for our battery runtime tests. This setting is sufficient for indoor environments and enables working with an ergonomic display brightness. Our review unit left a good impression outdoors and we could even see the display content under direct morning sunlight. This is hard with the brightness setting 8 and it does not work for longer periods. However, if you adjust the display for an optimal viewing position to avoid direct sunlight you won't necessarily need the maximum brightness all the time for comfortable working. 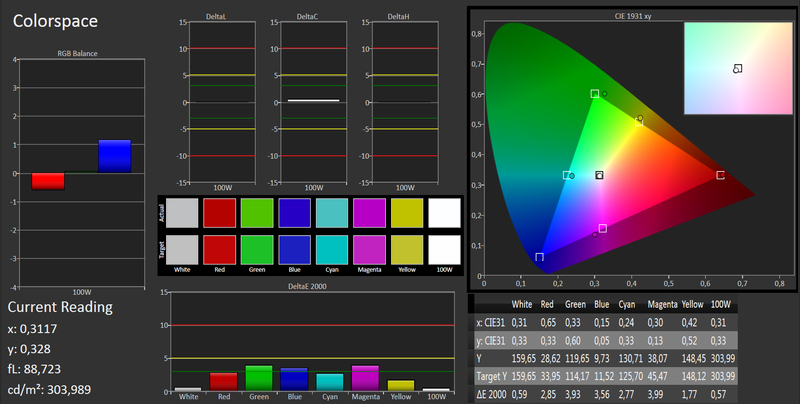 Another strength of the panel is the good contrast ratio of 888:1. It is not a record, but a noticeable improvement compared to less expensive panels and it creates subjectively good blacks and rich colors. 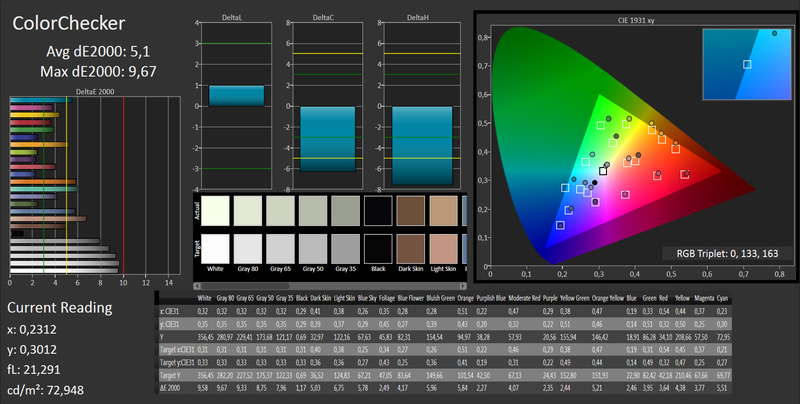 The color space coverage is good, with 62% AdobeRGB and 90% sRGB. 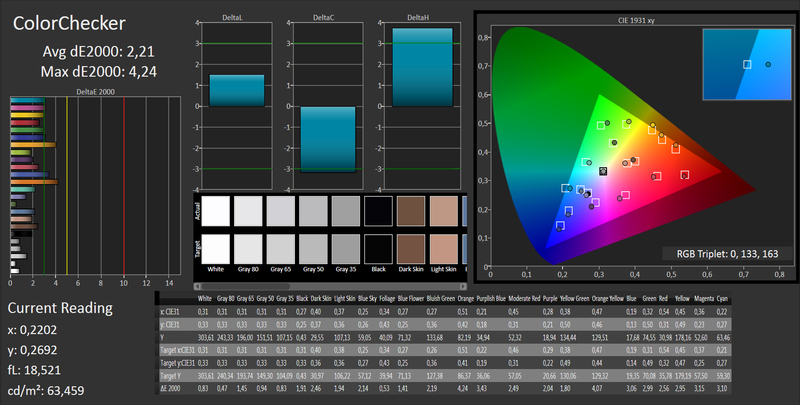 These results should be sufficient for many usage scenarios, especially professional picture editing, which requires good color accuracy besides the available sRGB color space. 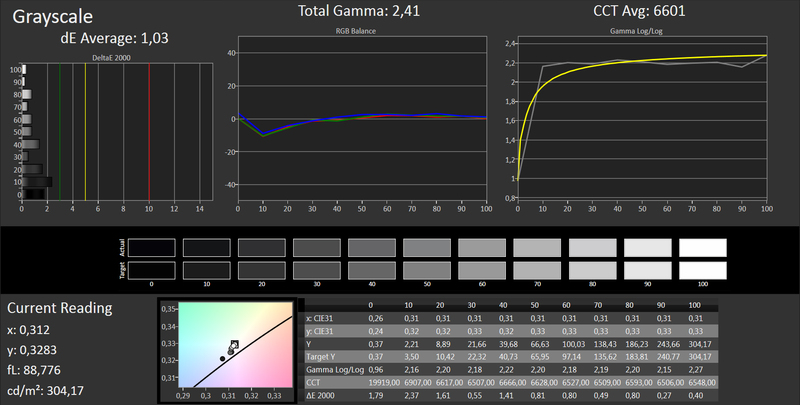 The panel is however not very accurate out of the box and professional editing is hardly possible with DeltaE2000 values over 10, an uneven RGB balance and an inaccurate gamma curve. The situation does change after the obligatory calibration and you get a usable working device. 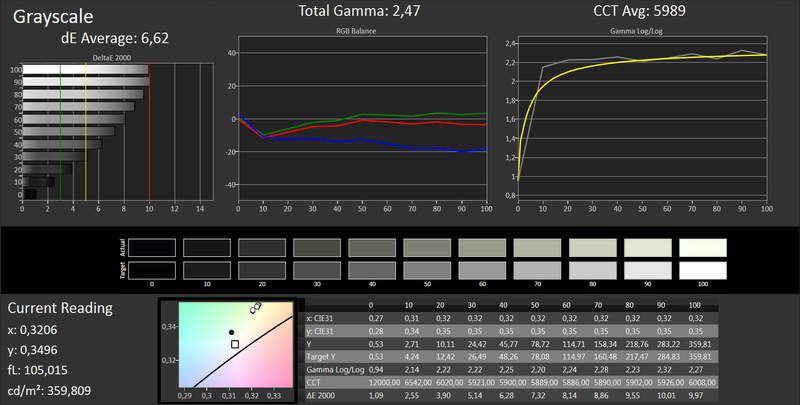 Only a few DeltaE2000 values are still above 4, the RGB balance is more even and the grayscale presentation is very good, but the gamma curve still shows some deviations. Overall, the viewing angle stability is very good and there are only small color and brightness changes. Depending on the lighting conditions and viewing angle, there can be some diffuse reflections from light sources that can slightly affect the image. This effect is enhanced, for example, by our viewing angle shots, especially with a tilted display towards the front. 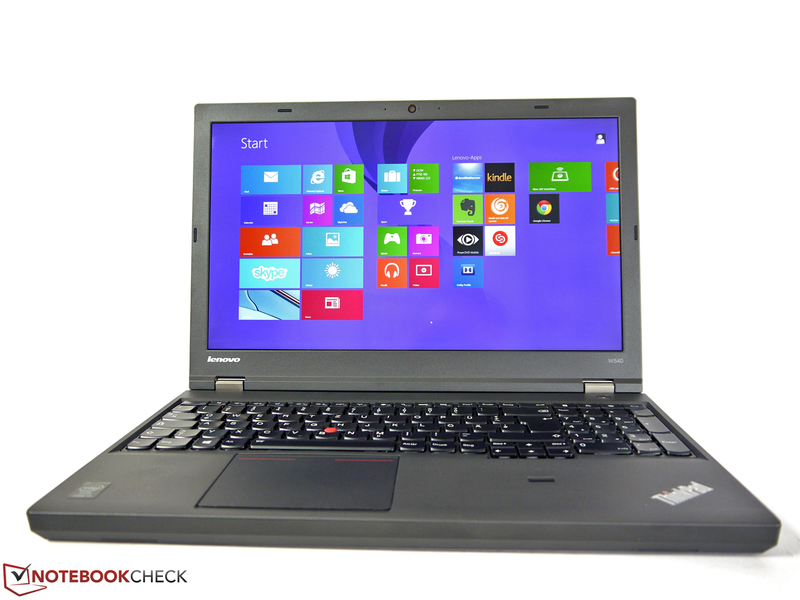 Lenovo currently offers the ThinkPad W540 Workstation with seven processors, all the way up to an Intel Core i7-4930MX. Besides the two professional graphics cards Nvidia Quadro K1100M and K2100M you can choose the memory and storage equipment. An alternative to the custom-built machines from the online shop are several pre-configured models that are sold by the associated retailers. Our review unit uses an Intel Core i7-4700MQ CPU, Nvidia's professional Quadro K1100M GPU, 4 GB RAM and a 1 TB hard drive. 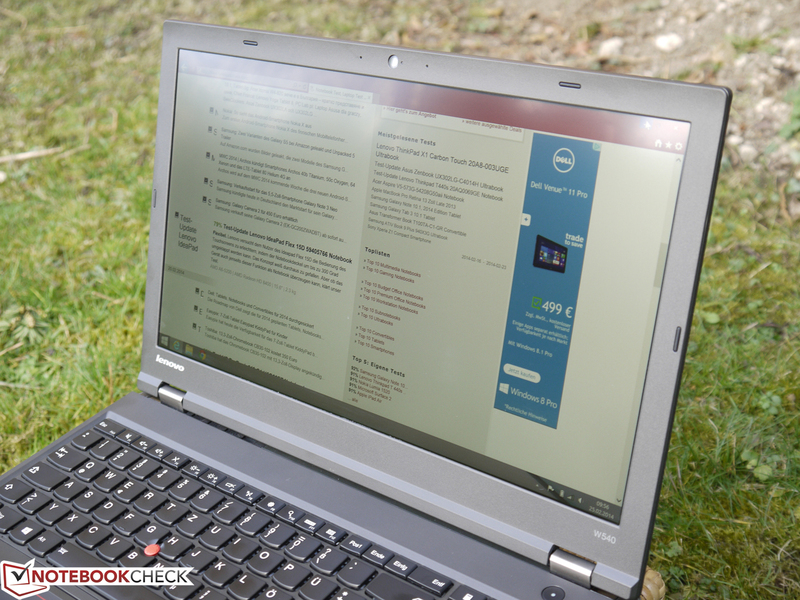 Our review unit is equipped with an Intel Core i7-4700MQ CPU that we already reviewed in many other notebooks. 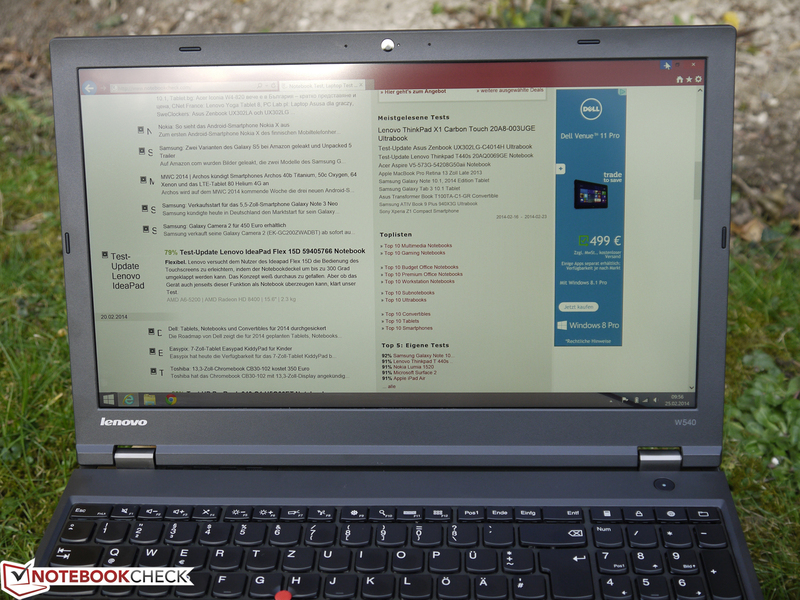 It is an appealing solution in terms of performance and is currently the cheapest option for the Lenovo ThinkPad W540 after the entry-level CPU Intel Core i5-4200M. The additional price is even lower than for the dual-core processors Intel Core i5-4330M and i7-4600M in Lenovo's online shop. Thanks to four native processor cores, four additional virtual cores (Hyperthreading) and the Turbo Boost technology, Intel's Core i7-4700MQ offers sufficient performance for any scenario. Multi-core optimized applications also benefit from the execution of 8 threads simultaneously and applications that only use one core benefit from the clock of up to 3,400 MHz. 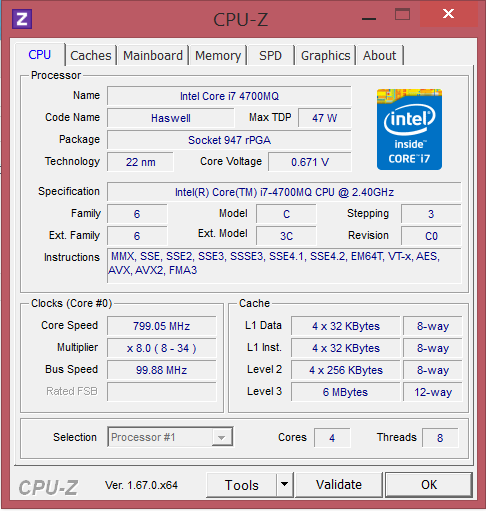 The benchmark results are on the usual level for the processor. 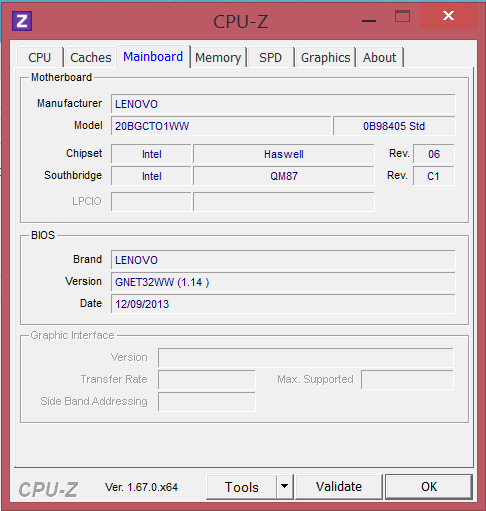 Cinebench R10 64-bit, for instance, shows 6,281 points (single) and 23,677 points (multi). Our practical tests with iTunes and MediaEspresso are on the expected level as well. iTunes manages 52.7 times the conversion speed and the video conversion via CPU shows that the Intel Core i7-4700MQ falls behind the Intel Core i7-4800MQ CPU. 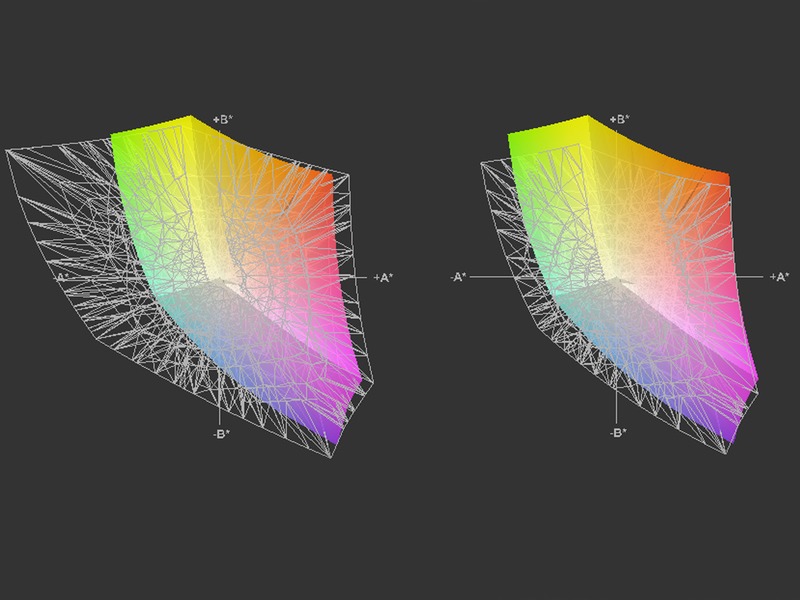 We use Prime95 and FurMark simultaneously to simulate maximum load and assess the stability of the performance. 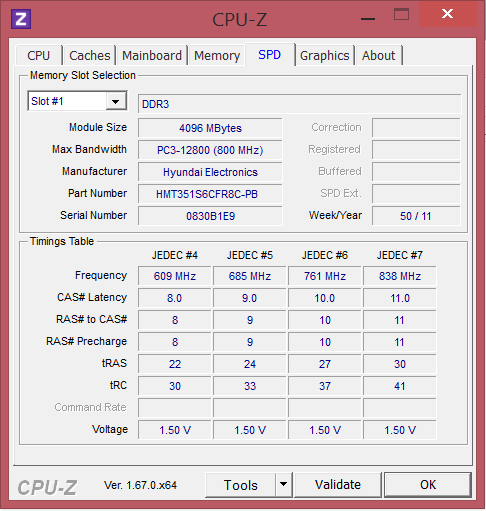 The CPU starts with the maximum clock of 3.0-3.1 GHz but drops to 2.7-2.8 GHz after around 10 minutes. This level can be maintained for nearly exactly 2 hours, after that the processor throttles to 800 MHz and is not able to increase the clock again under the same load. We continued the test for around 40 minutes and could not determine a higher clock. 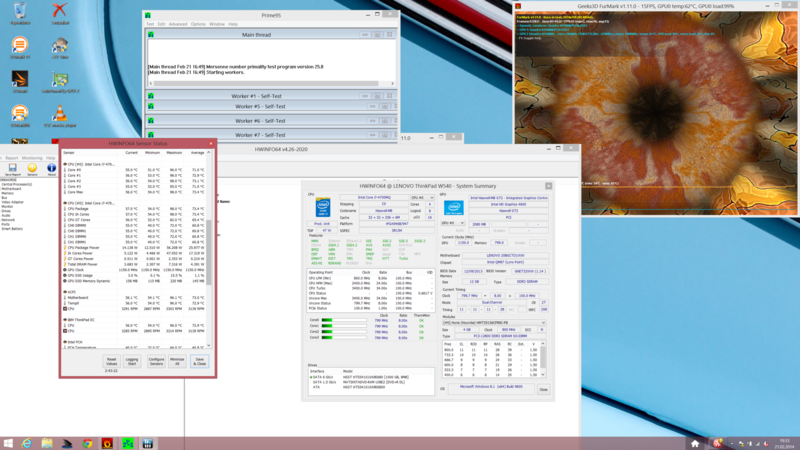 The processor is cooled down to around 55 °C (131 °F) in this situation according to HWinfo 64. Operation on battery power reduces the CPU performance by around 42% in general. 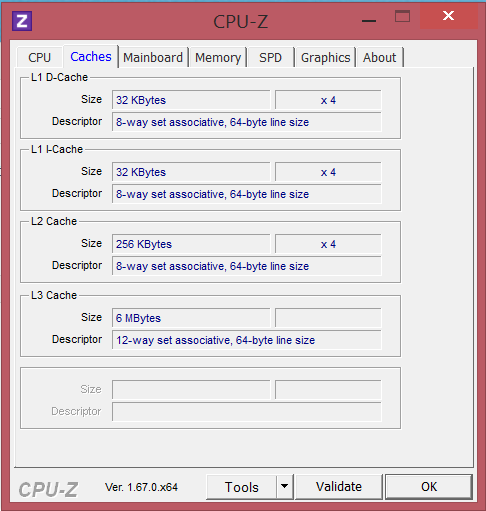 Cinebench R11.5 for example only results in 3.96 instead of 6.71 points. You can minimize this effect if you change the BIOS setting to "maximum performance on battery". 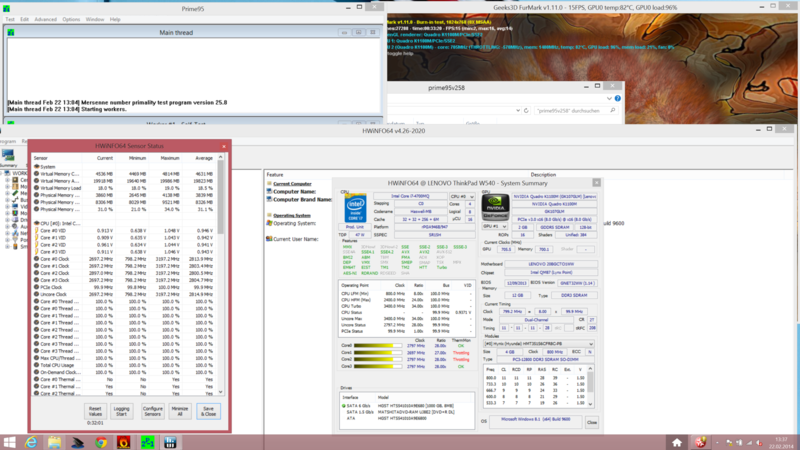 After that, you can use around 72% of the CPU performance, which results in 5.09 points for the Cinebench R11.5 Multi test.